I got my picnic quilt finished, just in time for some gorgeous spring weather! We spent the last couple of days down in beautiful Southern Vermont, and those few hours in the car provided a perfect opportunity to work on the binding on this quilt. This patchwork quilt is made up predominately of lovely Denyse Schmidt prints – some Flea Market Fancy, a little Katie Jump Rope, and lots of her newest line for Joann’s. I love how well they all work together, and I think they’re just fabulous in a simple patchwork design. I used 3 1/2″ squares and it’s definitely the largest patchwork quilt I’ve made to date, finishing at about 70″ square, which I think will be the perfect size for the three of us to relax on this summer. I used one of the large plaid prints from the DS Quilts line for the backing. I didn’t use it in the quilt top, as I thought the pattern was a bit too large, but thought it would be an ideal backing for a picnic quilt. Unfortunately, and what you can’t see here, is that the piece I bought seemed to not be printed quite straight, so it doesn’t line up quite as well as I’d like, but that’s ok — who’s looking at the back anyway?! Unlike other quilts I’ve made in the past which I thought would be used as picnic quilts, this one actually will get used outdoors! 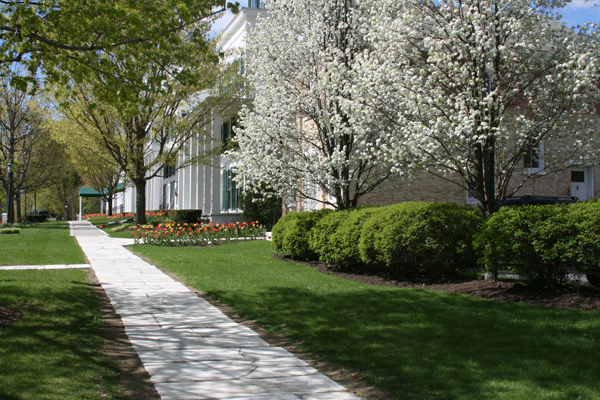 And in fact, we tried it out straightaway, enjoying our morning coffee and scones out in the park. I’m looking forward to many more!! This entry was posted in [search] Charm Quilts, Finished Quilts, Posts about Quilts, Quilts and tagged denyse schmidt, ds quilts, fairground, flea market fancy, handmade, Katie Jump Rope, patchwork quilt, picnic, quilt, quilting, scrap quilt. Bookmark the permalink. 43 Responses to fancy a picnic? Ack! Gorgeous. That quilt AND your little boy. The quilt is so fun and lovely. And those are the most perfect toes ever! Beautiful quilt, handsome boy, oh, and lovely Mom. Wow! I am impressed with your speediness. Lovely! 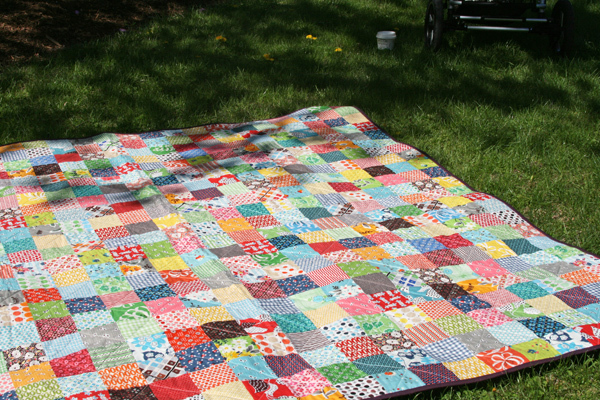 The quilt is lovely and I hope many happy memories are had this first and oh so precious summer with a new little one. I am not sure any of the plaid was printed straight – I talked to the lady at the cutting counter when I was getting my fabric, and she could not get the plaid to cut straight from the bolt. 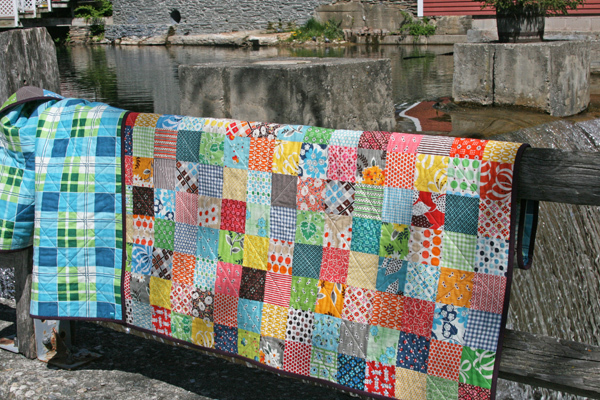 a perfect picnic quilt, love the backing. Max is getting so big, isn’t crazy how fast it goes?! Beautiful! Those lines work so well together. Such a cheery quilt! This is a beautiful quilt! I love all the colors and patterns. And it’s so big! I hope your family enjoys many, many, many picnics on that beautiful quilt. And Max will be, before very long you’ll find, crawling on it, then toddling on it and then you’ll be sitting on it watching him play little league. Believe me, it seems to happen that fast. 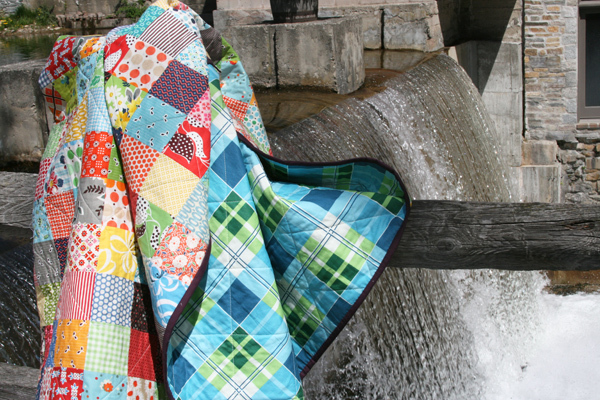 This is a lovely quilt – perfect for the outdoors! And I love the two sets of feet! Too cute! Love the quilt and love those toes! Gorgeous quilt! Congrats on the finish! Beautiful quilt and beautiful setting. I think I recognize that spillway from my trip to VT last summer! Gorgeous work … as always. I can’t tell you how impressed I am that you have managed to make this while mothering a newborn!! I was a blithering wreck at this stage. Great! There is nothing better, is there not? Your family on your quilt – just enjoying. Well done! And think of the summer ahead of you all!! I am loving watching you mother Max. Such a precious place in time. The quilt is great, as usual, but I absolutely love that last photo!! It turned out great and your son is just too adorable [and I am not just saying that to be nice!!!] You have inspired me to use this fabric. The only one I didn’t get was that large plaid. It does look cute for the backing. This quilt is really beautiful! 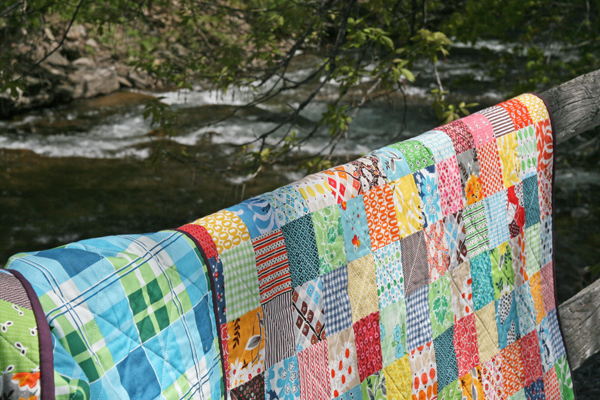 The fabrics and colours are just right for a picnic quilt – they scream summer! that is lovely! and a beautiful day to use it too! 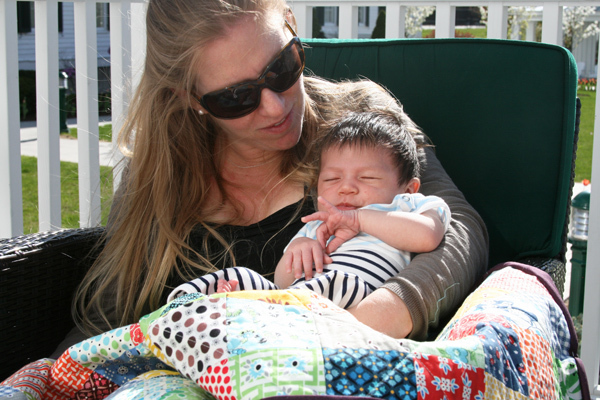 So great to see you outside enjoying your quilt as a family! 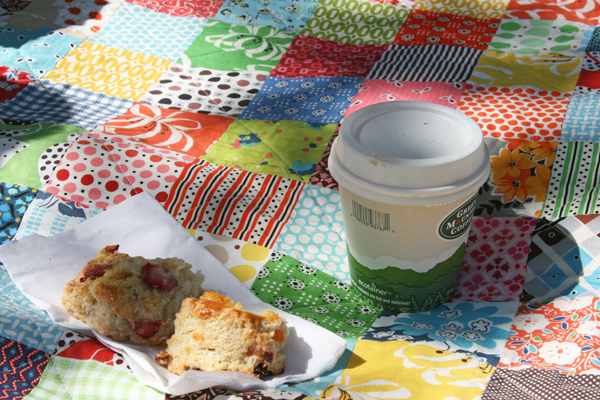 The PERFECT picnic quilt…love it! The quilt is beautiful and your son is gorgeous. I am so impressed that you had the time a d energy to make this quilt being a mom to a newborn. You are amazing! Congratulations! Your blog is among the 55 best quilt blogs according to Quilt Home magazine. Of course, we all knew it all along! He’s growing so fast!! Love your quilts. Just wanted you to know I scored my copy of 101 Patchwork just so I could make your quilt. Thanks for letting us know where to find it! I’ll post pictures (this project is in a queue right now) on my blog when I start it. I’ll be doing Amy Butler’s Love–yes, I’ve saved it for ages, just waiting for the perfect quilt. So, thanks! The quilts stand out so nicely with that backdrop. What a great place for pictures. Someone must be a photographer in your family. The quilts are just perfect and I look forward to your next posting. 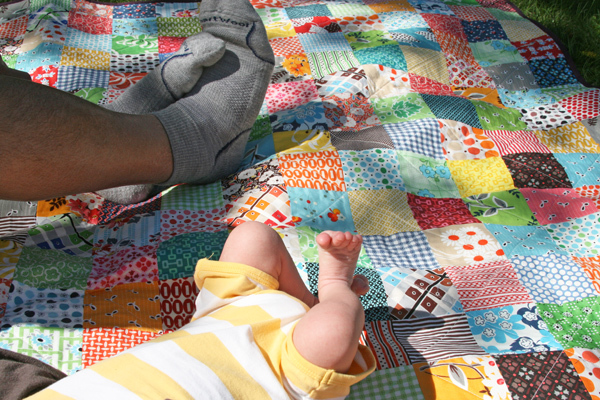 The quilt and the baby toes are adorable!! It’s great to have a beautiful quilt that goes with your everyday life. I love quilts made of so many different colors, my style of quilting. I LOVE the colors and look of these solids and can’t wait to start a quilt with them! It’s so fun to watch how fast your little one grow. He’s a great model with your quilts! So warm and inviting to sit a spell! Lovely quilts!